Doctor Geek's original video content presented by The Brazen Wench Network. With the second season of Doctor Geek’s Laboratory Of Applied Geekdom approaching, Brazen Wench Productions, is proud to announce the creation of The Brazen Wench Network (The BW). While you will still be able to find our videos on our YouTube Channel,The BW will be the official home of all original video content for all Brazen Wench productions. 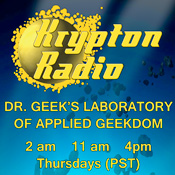 For all our fans of the podcast who want to know what the Laboratory of Applied Geekdom looks like, here is an excerpt fromEpisode 2 – Elevators, Oracles, and Skycars, Oh My!